Spring is beginning to blossom as winter comes to an end. 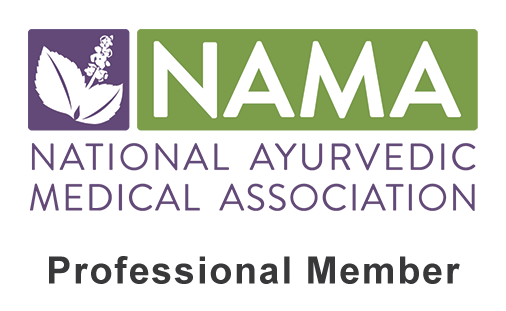 Kapha dosha is officially at its climax with colds, cough, congestion and seasonal allergies becoming more and more prevalent throughout. As we say goodbye to the dark, cool and heavy qualities that the winter months bring, it becomes more important than ever to welcome more lightening, cleansing, reducing and stimulating activities and meals into our daily lives. This spicy dahl and peppered rice recipe is a wonderful meal option for this time of year as it will undoubtably boost the digestive fire, burn toxins, clear away congestion and get the blood pumping! 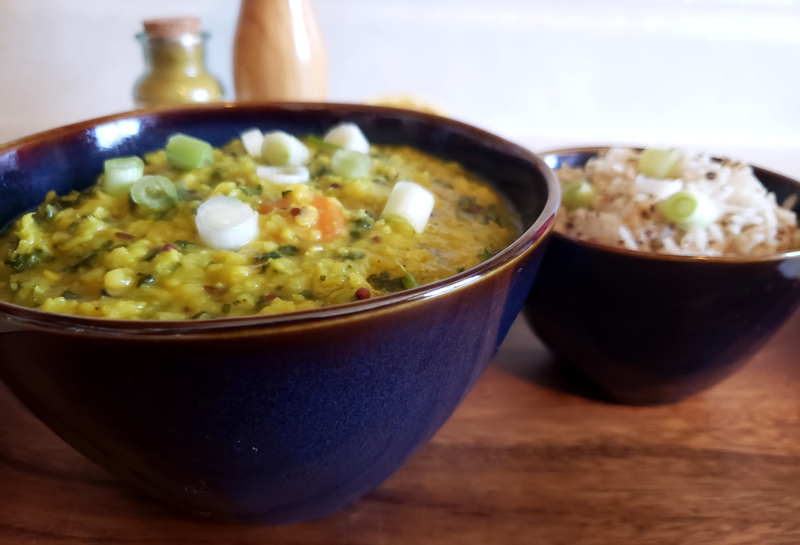 Whether you are looking for more lightness in your life or are focused on performing some deep cleansing for the spring, this spicy dahl recipe will be a great addition to help you achieve your goals. It can be used as a staple in your springtime diet to help reduce congestion, boost the digestion and metabolism, energize the system, aid in weight loss, alleviate symptoms of allergies or ward away cold and flu. 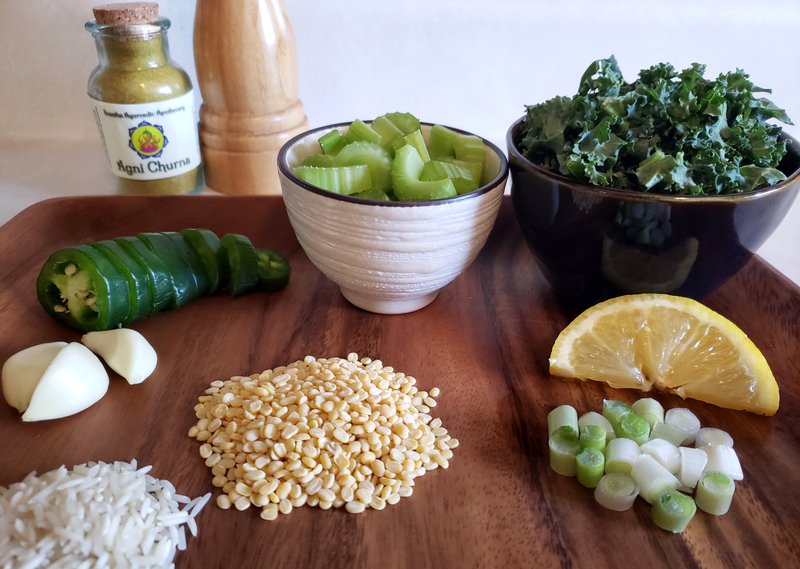 If a kitchari cleanse is in your future, this recipe will be equally as beneficial for providing a detoxifying kitchari meal for the duration of your cleanse. Although this recipe is perfect for the cleansing nature of spring, it can be very healing during the fall and winter months as well. Due to the spicy nature of the recipe, it is fairly Pitta provoking and should be used with caution (or avoided) during the summer months (aka Pitta season). Otherwise it is a great option for both Kapha and Vata types, and may be beneficial for Pitta during the appropriate months and when utilizing the recommended Pitta-specific “optional doshic variations” that are listed below the recipe. *This recipe is very heating, however during times of cleansing, sickness or colder months Pitta types may still benefit as the heat helps to flush out the system, promote sweating, remove obstruction and detoxify the system. See the optional Pitta variations listed below the recipe to make this recipe more suitable for Pitta types. 5 tsp whole black peppercorns (1 tsp freshly ground for dahl and 4 tsp whole for rice) *please do not use pre-ground pepper, freshly ground peppercorns will be much more flavorful! 1. Rinse the rice in a small strainer to get off any starches and residue. Alternatively the rice can be soaked in water overnight or for several hours prior to cooking. 2. Bring 2 cups of water along with 1 Tbsp of ghee to a boil in a medium sauce pan. 3. Once boiling, reduce the heat to low and add in one cup of rice. Stir well and cover, leaving a slight crack to avoid overflow. 4. Cook here for about 13-15 minutes or until the rice is fluffy, soft and has soaked up most of the water. 5. Once the desired cooking time has been reached, cover the pot and set the rice aside. 1. Heat a small sauté pan over medium heat. 2. 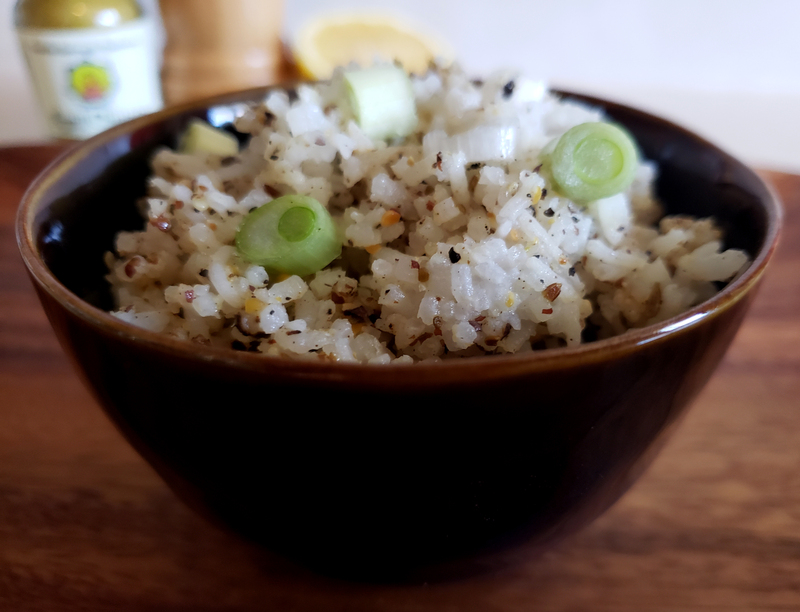 Once hot, add in 2 Tbsp of sesame seeds, 4 tsp whole black peppercorns, 1 Tbsp (3 tsp) cumin seed and 1 Tbsp (3 tsp) brown mustard seed. 3. Dry sauté the spices over a medium heat stirring constantly until the sesame seeds begin to tan slightly. 4. Add the roasted spices to a spice grinder and grind into a fairly coarse powder. 5. Add the powdered spices to the cooked rice and stir until the rice is evenly coated. Cover the peppered rice and set aside until the dahl is cooked. 1. Add 1 Tbsp of ghee to a large sauce pan and turn the heat to low-medium. Once the ghee has melted add in 2 tsp of cumin seed, 2 tsp of brown mustard seed, 1 tsp of fennel seed, 1 tsp freshly ground black pepper, 2-3 cloves of minced garlic, 1 medium minced jalapeño, a small pinch of hing and a large pinch of cayenne pepper ( about 1/8-1/4 tsp). Stirring frequently, sauté these spices for about 2-3 minutes until the seeds begin to pop. 2. Once the spices are well roasted, add in 6 cups of water and increase the heat to come to a boil. 3. 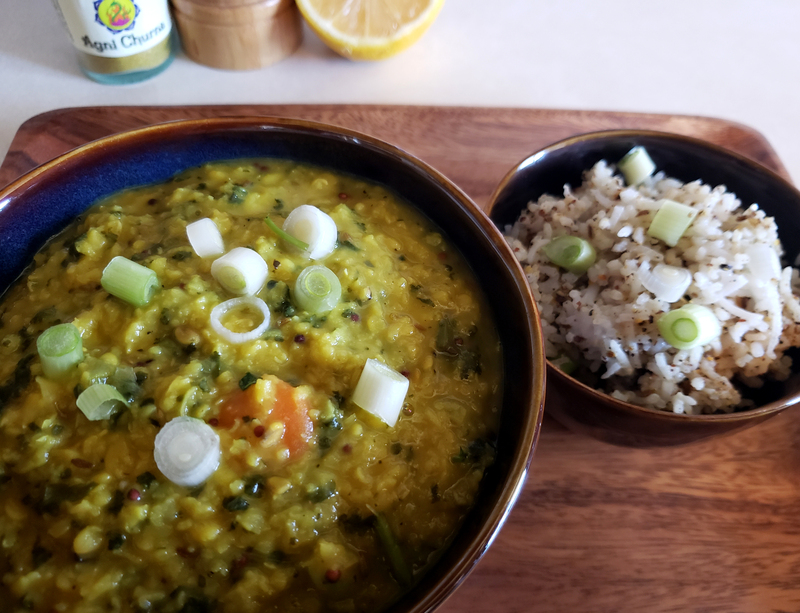 Once boiling, reduce the heat to low and add in 2 cups of mung dahl, 1-1.5 tsp of turmeric, 1 tsp of ginger powder and 1 tsp of fenugreek seed. Cook covered leaving a small crack to avoid overflow for 10 minutes. 4. After the first 10 minutes of cooking add in the chopped carrots, celery and kale. Continue to cook over low heat for an additional 25-30 minutes stirring every 5-7 minutes. IMPORTANT NOTE: The dahl will be finished once the beans are very soft and lose their form. The veggies should also be very soft. If the dahl is preferred to be more soupy, extra water can be added during the cooking time until the desired consistency has been reached. 5. Once the dahl is fully cooked, take the pot off of the heat. Add in 1/2 to 1 tsp of salt along with the fresh lemon juice, the chopped green onion and the chopped cilantro. Stir well until everything is evenly combined. 6. Now it is time to serve! Make a bowl by placing the peppered rice on the bottom and pouring the dahl over the top. Most individuals enjoy this mix to be about 1 part rice to 1 part dahl. However, if you prefer more of one than the other, go with that. I personally enjoy about 1 part rice to 2 parts dahl. 7. After the dahl and rice are in a bowl, stir well to blend them together. Add extra salt, pepper, ghee (up to 1 tsp), fresh lemon juice, green onion and cilantro as desired. These extra little garnishes can make a big difference so don’t be shy! 8. Enjoy this spicy dahl and peppered rice dish during the cooler months of the fall, winter and spring seasons. 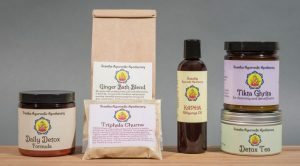 It is a perfect complement to any cleanse, but will be equally as beneficial when made as a main meal during times of illness, allergies, sluggish digestion, slow metabolism, weight loss, Kapha imbalance, cold, congestion, cough or poor circulation. This recipe is warm, mushy and well cooked making it a great meal option for Vata types. However, Vata may become excessively dry, gassy or bloated due to the spicy nature of this recipe and therefore a few changes can be made. The garlic should be reduced to 1-2 cloves, the amount of jalapeño can be cut in half, the cayenne pepper should be kept at 1/8 tsp and the dry ginger powder can be replaced with an equal amount of finely grated fresh ginger. 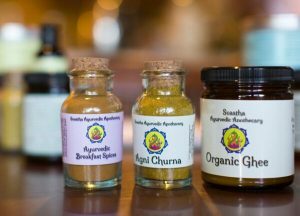 Extra ghee can be added as needed. To make this a bit more creamy and nourishing for Vata, one can add in 1-2 large spoonfuls of tahini after the cooking process is complete (yummy!!). This spicy recipe can often be too much heat for fiery Pitta types. For this omit the cayenne pepper, fenugreek seed and hing. Reduce the garlic to one clove. The amount of black pepper and brown mustard seed can be cut in half for both the dahl and the rice recipe. The sesame seeds and minced jalapeño can also be cut in half. The lemon juice should be replaced with lime and the dry ginger should be replaced with an equal amount of finely grated fresh ginger. Extra cilantro should be added along with some shredded coconut (about 1 tsp per bowl) to help cool down the recipe. This recipe is very heating and stimulating making it a great meal option for Kapha types. Everything can remain the same to help pacify Kapha and treat Kapha imbalances (weight gain, congestion, allergies, cough, etc). The only change that may be needed is regarding the basmati rice since grains (especially refined) are often not tolerated by Kapah individuals. In this case one can replace the basmati rice with quinoa. When serving, the dahl should be at 2-3 parts for every 1 part of grain (whether rice or quinoa). Extra veggies can be added to the dahl such as broccoli or cauliflower and extra spices are always welcome (although this recipe is quite spicy as is!). The amount of ghee should be cut in half.